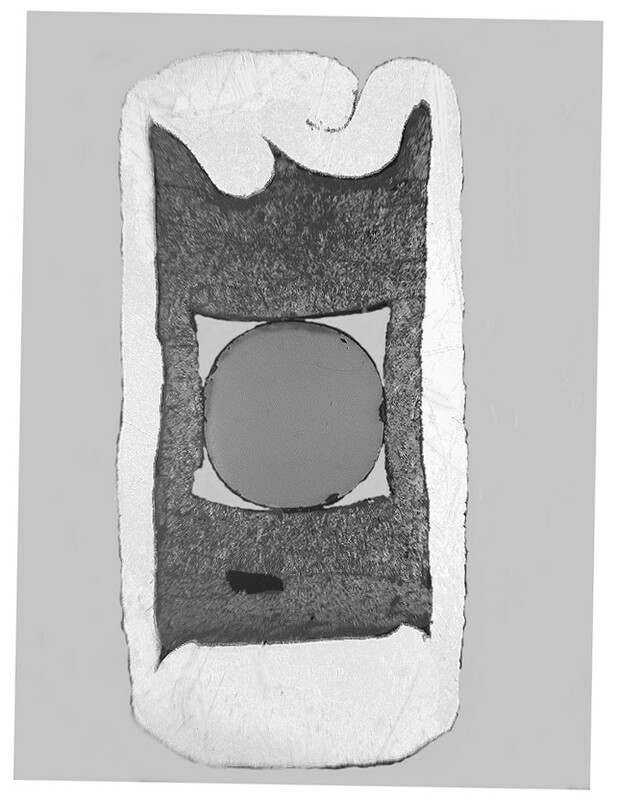 Figure 1: A sample of silicate melt (circular) that was experimentally equilibrated with carbon dioxide at 1400 ˚C and 10 kbar in a graphite-lined platinum capsule with a diameter of 3 mm. My research focuses on the geochemistry behind the mobility, transport and re-distribution of elements during high-temperature processes. The results of these processes are depletions, enrichments (including ore deposits), and other geochemical signatures. I use the techniques of experimental petrology to prepare analogues of natural samples under controlled conditions (e.g. Figure 1), thus allowing the effects of variables such as pressure, temperature, composition and oxygen fugacity to be disentangled. Figure 2: 3-D representation of the oxidation state of Fe (distribution of Fe3+) in a crystal of garnet in peridotite from Wesselton, South Africa. The image is ~ 500 x 500 microns. My main analytical tool is synchrotron light (e.g. the Australian Synchrotron, www.synchrotron.org.au/‎). Geochemists use a range of instruments to determine the amounts (often at vanishingly small concentrations) of elements and isotopes. However, the geochemical behaviour of an element depends on its chemical environment or speciation. For example, two different oxidation states of an element behave geochemically as if they were different elements. Despite most elements occurring in more than one oxidation state chemical speciation is almost never determined because it is experimentally difficult. X-ray absorption spectroscopy (XAS), undertaken at a synchrotron light source, however, is a relatively new technique that is ideal for this purpose: not only can the oxidation state be determined (Figure 2) but also the number and distances of coordinating elements (i.e. the site in a crystal or the complex in a fluid or melt). A particular advantage of XAS is that it is suited to in situ experiments on samples under geological conditions. This means that fluids and melts, the primary agents of mass transfer in the Earth, can be studied directly without having to worry about changes in solubility, speciation, or structure that might occur on cooling. Figure 3: Distribution of water, determined by FTIR spectroscopy, in a degassing basaltic melt that is partially enclosed in a crystal of olivine. 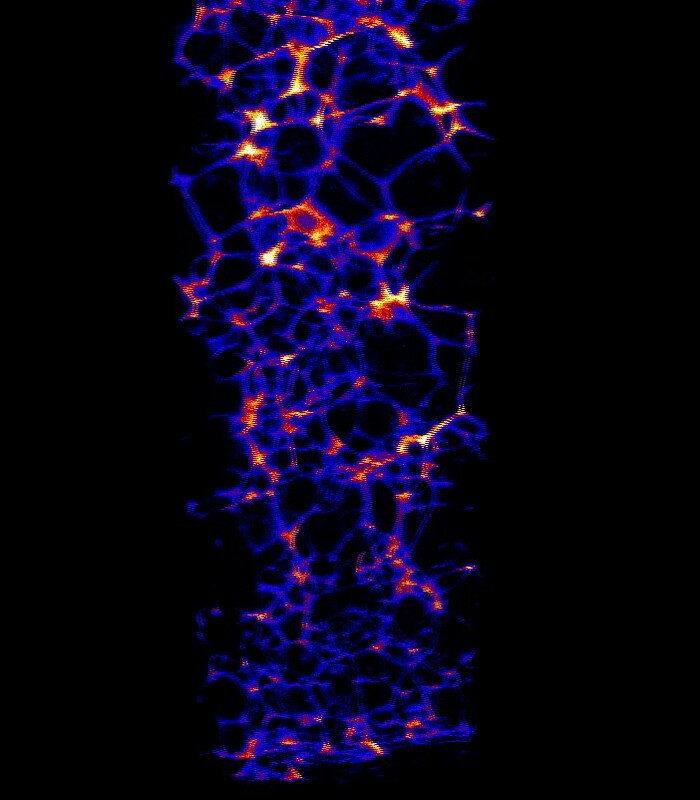 The image is ~ 250 x 250 microns. A major research focus this year will be quantifying the ratio of Fe3+ to Fe2+ in mid-ocean ridge basalt, which is somewhat surprisingly still controversial. In particular we are investigating the effect of degassing (S and water) on the oxidation state of the melt. Figure 3 shows variations in water in a partially degassed melt that we can correlate with S content, the oxidation state of S, and the oxidation state of Fe. Figure 4: Melt connectivity along grain boundaries of an analogue for partially molten mantle peridotite. The sample is 250 microns wide. 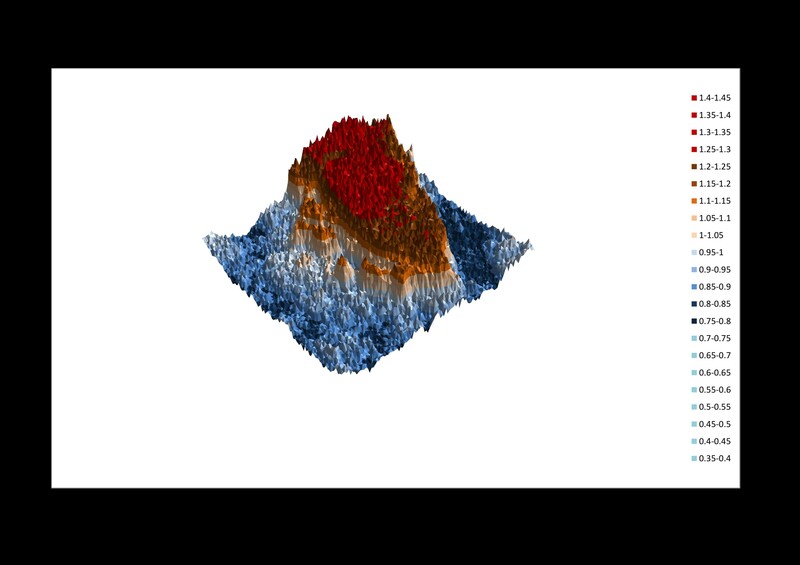 This year we are also developing new methods to image the 3-D distribution and inter-connectivity of basaltic melt in partially molten peridotite (Figure 4). The connectivity of melt in the upper mantle exerts a strong control on permeability and the rate at which magmas are transported from the source to the surface. Metasomatism of the mantle can be recognised from the trace element signature of garnet peridotite. The oxygen fugacity of this process, inferred from the ratio of Fe3+ to Fe2+ in garnet, is thought to be sufficiently low that diamond remains stable. However, metasomatism may in fact be sufficiently oxidising for diamond to convert to carbonate. In this project the effects of mantle metasomatism on trace element signatures and the oxidation state of Fe will be investigated both experimentally and by studying natural samples. For more information see: A.J. Berry, G.M. Yaxley, B.J. Hanger, A.B. Woodland, M.D. de Jonge, D.L. Howard, D. Paterson, and V.S. Kamenetsky. Quantitative mapping of the oxidative effects of mantle metasomatism. Geology, 41, 683-686 (2013). The rare-earth element (REE) patterns of zircon frequently exhibit anomalous abundances of Ce and Eu due to the stability of these elements in oxidation states other than REE3+. While a negative Eu anomaly can be attributed to depletion arising from substitution into early crystallising plagioclase, a positive Ce anomaly may record the oxygen fugacity of the melt. The magnitude of the anomaly is a potential oxy-barometer and may be an indicator of porphyry copper mineralisation. For more information see: A.D. Burnham and A.J. Berry. An experimental study of trace element partitioning between zircon and melt as a function of oxygen fugacity. Geochimica et Cosmochimica Acta, 95, 196-212 (2012). The presence of U series isotopes that are not in secular equilibrium in basalts at spreading centres has been interpreted to mean that the rate of melt transport from the source, where disequilibria is assumed to be generated by differences in partitioning during partial melting, to the surface is sufficiently fast for the signature to be preserved. U is assumed to occur exclusively as U4+ in the mantle source but the presence of U6+ (or U5+) would change how U partitions. The oxidation state of U in basaltic glasses and melts has been determined and surprising variations identified. Rare-earth elements (REE) are regarded as critical metals due to their importance for technology and geopolitical uncertainty of supply. They are frequently associated with carbonatites, however, the process(es) that results in REE enrichment in these unusual melts is unknown. In this project the partitioning of REE between key mineral phases and carbonatites is being investigated. The mineral hibonite was the second phase to condense from the solar nebula. It is able to accommodate Ti as both Ti3+ and Ti4+ and the ratio of the two oxidation states may reflect the oxygen fugacity, and hence gas phases composition, of the solar nebula. Hibonite was synthesised over a range of conditions to investigate the relationship between the oxidation state of Ti, oxygen fugacity, and crystal chemistry. For more information see: P.M. Doyle, P.F. Schofield, A.J. Berry, A.M. Walker, and K.S. Knight. Substitution of Ti3+ and Ti4+ in hibonite (CaAl12O19). American Mineralogist, 99, 1369-1382 (2014). A.J. Berry, G.M. Yaxley, B.J. Hanger, A.B. Woodland, M.D. de Jonge, D.L. Howard, D. Paterson, and V.S. Kamenetsky. Quantitative mapping of the oxidation state of iron in mantle garnet. Geology April 2013. A.D. Burnham and A.J. Berry. An experimental study of trace element partitioning between zircon and melt as a function of oxygen fugacity. Geochimica et Cosmochimica Acta (submitted). G.M. Yaxley, A.J. Berry, V.S. Kamenetsky, A.B. Woodland, and A.V. Golovin. An oxygen fugacity profile through the Siberian Craton - Fe F-edge XANES determinations of Fe3+/SFe in garnets in peridotite xenoliths from the Udachnaya East kimberlite. Lithos, 140-141, 142-151 (2012) . I.S. Rodina, A.N. Kravtsova, A.V. Soldatov, and A.J. Berry. Study of local atomic and electronic structure of titanium-containing forsterite based on analysis of X-ray absorption spectra. Optics and Spectroscopy, 111, 936-939 (2011) . J.M. Griffin, A.J. Berry, and S.E. Ashbrook. Observation of "hidden" magnesium: first-principles calculations and 25Mg solid-state NMR of enstatite. Solid State Nuclear Magnetic Resonance, 40, 91-99 (2011) . N.D. Tailby, A.M. Walker, A.J. Berry, J. Hermann, K.A. Evans, J.A. Mavrogenes, H.St.C. O'Neill, I.S. Rodina, A.V. Soldatov, D. Rubatto, and S.R. Sutton. Ti site occupancy in zircon. Geochimica et Cosmochimica Acta, 75, 905-921 (2011) . A.J. Berry, G.M. Yaxley, A.B. Woodland, and G.J. Foran. A XANES calibration for determining the oxidation state of iron in mantle garnet. Chemical Geology, 278, 31-37 (2010) . J.M. Griffin, J.R. Yates, A.J. Berry, S. Wimperis, and S.E. Ashbrook. High-resolution 19F MAS NMR spectroscopy: structural disorder and unusual J couplings in a fluorinated hydroxy-silicate. Journal of the American Chemical Society, 132, 15651-15660 (2010) . J.M. Griffin, A.J. Miller, S. Wimperis, A.J. Berry, and S.E. Ashbrook. Dynamics on the microsecond timescale in hydroxyl-clinohumite studied by 2H solid-state NMR spectroscopy. Physical Chemistry Chemical Physics, 12, 2989-2998 (2010) . J.M. Griffin, S. Wimperis, A.J. Berry, C.J. Pickard, and S.E. Ashbrook. Solid-state 17O NMR spectroscopy of hydrous magnesium silicates: evidence for proton dynamics. Journal of Physical Chemistry C, 113, 465-471 (2009) . N. Métrich, A.J. Berry, H.St.C. O'Neill, and J. Susini. The oxidation state of sulfur in synthetic and natural glasses determined by X-ray absorption spectroscopy. Geochimica et Cosmochimica Acta, 73, 2382-2399 (2009) . A.J. Berry, A.C. Harris, V.S. Kamenetsky, M. Newville, and S.R. Sutton. The speciation of copper in natural fluid inclusions at temperatures up to 700 ˚C. Chemical Geology, 259, 2-7 (2009) . A.J. Berry, L.V. Danyushevsky, H.St.C. O'Neill, M. Newville, and S.R. Sutton. The oxidation state of iron in komatiitic melt inclusions indicates hot Archaean mantle. Nature, 455, 961-963 (2008) . H.St.C. O'Neill, A.J. Berry, and S.M. Eggins. The solubility and oxidation state of tungsten in silicate melts: implications for the comparative chemistry of W and Mo in planetary differentiation processes. Chemical Geology, 255, 346-359 (2008) . S.E. Ashbrook, A.J. Berry, D.J. Frost, A. Gregorovic, C.J. Pickard, J.E. Readman, and S. Wimperis. 17O and 29Si NMR parameters of MgSiO3 phases from high-resolution solid-state NMR spectroscopy and first-principles calculations. Journal of the American Chemical Society, 129, 13213-13224 (2007) . A.J. Berry, H.St.C. O'Neill, J. Hermann, and D.R. Scott. The infrared signature of water associated with trivalent cations in olivine. Earth and Planetary Science Letters, 261, 134-142 (2007) . A.J. Berry, A.M. Walker, J. Hermann, H.St.C. O'Neill, G.J. Foran, and J.D. Gale. Titanium substitution mechanisms in forsterite. Chemical Geology, 242, 176-186 (2007) . A.M. Walker, J. Hermann, A.J. Berry, and H.St.C. O'Neill. Three water sites in upper mantle olivine and the role of titanium in the water weakening mechanism. Journal of Geophysical Research 112, B05211, doi:10.1029/2006JB004620 (2007) . J. Hermann, J. Fitz Gerald, N. Malaspina, A.J. Berry, and M. Scambelluri. OH-bearing planar defects in olivine produced by the breakdown of Ti-rich humite minerals from Dabie Shan (China). Contributions to Mineralogy and Petrology, 153, 417-428 (2007) . S.E. Ashbrook, L. Le Polles, C.J. Pickard, A.J. Berry, S. Wimperis, and I. Farnan. First-principles calculations of solid-state 17O and 29Si NMR spectra of Mg2SiO4 polymorphs. Physical Chemistry Chemical Physics, 9, 1587-1598 (2007) . A.J. Berry, H.St.C. O'Neill, D.R. Scott, G.J. Foran, and J.M.G. Shelley. The effect of composition on Cr2+/Cr3+ in silicate melts. American Mineralogist, 91, 1901-1908 (2006) . A.J. Berry, A.C. Hack, J.A. Mavrogenes, M. Newville, and S.R. Sutton. A XANES study of Cu speciation in high-temperature brines using synthetic fluid inclusions. American Mineralogist, 91, 1773-1782 (2006) . H.St.C. O'Neill and A.J. Berry. Activity coefficients at low dilution of CrO, NiO and CoO in silicate melts in the system CaO-MgO-Al2O3-SiO2 at 1400 ˚C: using the thermodynamic behaviour of transition metal oxides in silicate melts to probe their structure. Chemical Geology, 231, 77-89 (2006) . X. Liu, H.St.C. O'Neill, and A.J. Berry. The effects of small amounts of H2O, CO2 and Na2O on the partial melting of spinel lherzolite in the system CaO-MgO-Al2O3-SiO2±H2O±CO2±Na2O at 1.1 GPa. Journal of Petrology, 47, 409-434 (2006) . H.St.C. O'Neill, A.J. Berry, C.A. McCammon, K.D. Jayasuriya, S.J. Campbell and G.J. Foran. An experimental determination of the effect of pressure on the Fe3+/Fe2+ ratio of an anhydrous silicate melt to 3.0 GPa. American Mineralogist, 91, 404-412 (2006) . A.J. Berry, J. Hermann, H.St.C. O'Neill, and G.J. Foran. Fingerprinting the water site in mantle olivine. Geology, 33, 869-872 (2005) . S.E. Ashbrook, A.J. Berry, W.O. Hibberson, S. Steuernagel, and S. Wimperis. High-resolution 17O NMR spectroscopy of forsterite (a-Mg2SiO4), wadsleyite (b-Mg2SiO4) and ringwoodite (g-Mg2SiO4). American Mineralogist, 90, 1861-1870 (2005) . J. Hermann, H.St.C. O'Neill, and A.J. Berry. Titanium solubility in olivine in the system TiO2-MgO-SiO2: no evidence for an ultra-deep origin of Ti-bearing olivine. Contributions to Mineralogy and Petrology, 148, 746-760 (2005) . K.D. Jayasuriya, H.St.C. O'Neill, A.J. Berry, and S.J. Campbell. A Mössbauer study of the oxidation state of iron in silicate melts. American Mineralogist, 89, 1597-1609 (2004) . A.J. Berry and H.St.C. O'Neill. A XANES determination of the oxidation state of chromium in silicate glasses. American Mineralogist, 89, 790-798 (2004) . A.J. Berry, H.St.C. O'Neill, K.D. Jayasuriya, S.J. Campbell, and G.J. Foran. XANES calibrations for the oxidation state of iron in a silicate glass. American Mineralogist, 88, 967-977 (2003) . A.J. Berry, J.M.G. Shelley, G.J. Foran, H.St.C. O'Neill, and D.R. Scott. A furnace design for XANES spectroscopy of silicate melts under controlled oxygen fugacities and temperatures to 1773K. Journal of Synchrotron Radiation, 10, 332-336 (2003) . S.E. Ashbrook, A.J. Berry, W.O. Hibberson, S. Steuernagel, and S. Wimperis. High-resolution 17O NMR spectroscopy of wadsleyite (b-Mg2SiO4). Journal of the American Chemical Society, 125, 11824-11825 (2003) . A.J. Berry and M. James. Refinement of hydrogen positions in natural chondrodite by powder neutron diffraction: implications for the stability of humite minerals. Mineralogical Magazine, 66, 441-449 (2002) . J.A. Mavrogenes, A.J. Berry, M. Newville, and S.R. Sutton. Copper speciation in vapor-phase fluid inclusions from the Mole Granite, Australia. American Mineralogist, 87, 1360-1364 (2002) . S.E. Ashbrook, S. Antonijevic, A.J. Berry, and S. Wimperis. Motional broadening: an important distinction between multiple-quantum and satellite-transition MAS NMR of quadrupolar nuclei. Chemical Physics Letters, 364, 634-642 (2002) . S.E. Ashbrook, A.J. Berry, and S. Wimperis. 17O multiple-quantum MAS NMR study of pyroxenes. Journal of Physical Chemistry B, 106, 773-778 (2002) . S.E. Ashbrook, A.J. Berry, and S. Wimperis. 17O multiple-quantum MAS NMR study of high-pressure hydrous magnesium silicates. Journal of the American Chemical Society, 123, 6360-6366 (2001) . A.J. Berry and M. James. Refinement of hydrogen positions in synthetic hydroxyl-clinohumite by powder neutron diffraction. American Mineralogist, 86, 181-184 (2001) . P.Y.B. Jar, A.J. Berry, K. Konishi, and T. Shinmura. Fracture initiation in emulsion-polymerised poly(acrylonitrile-butadiene-styrene) (ABS). Journal of Materials Science Letters, 20, 655-657 (2001) . J.A. Mejias, A.J. Berry, K. Refson, and D.G. Fraser. The kinetics and mechanism of MgO dissolution. Chemical Physics Letters, 314, 558-563 (1999) . S.E. Ashbrook, A.J. Berry, and S. Wimperis. Three- and five- quantum 17O MAS NMR of forsterite Mg2SiO4. American Mineralogist, 84, 1191-1194 (1999) . I.D. Morrison, A.J. Berry, and R.G. Denning. Energy levels of terbium(III) in the elpasolite Cs2NaTbCl6. Molecular Physics, 96, 43-51 (1999) . A.J. Berry, B.D. Cole, and R.S. Armstrong. Raman spectra of the a-alums CsM(SeO4)2.12H2O (M = Ga, In). Journal of Raman Spectroscopy, 30, 73-76 (1999) . R.G. Denning, A.J. Berry, and C.S. McCaw. Ligand dependence of the correlation crystal field. Physical Review B, 57, R2021-R2024 (1998) . A.J. Berry, I.D. Morrison, and R.G. Denning. Energy levels of terbium(III) in the elpasolite Cs2NaTbF6. Molecular Physics, 93, 1-14 (1998) . A.J. Berry, R.G. Denning, and I.D. Morrison, Two-photon Zeeman spectroscopy of terbium(III) elpasolites. Journal of Chemical Physics, 106, 8967-8973 (1997) . A.J. Berry, R.G. Denning, and I.D. Morrison, Two-photon excitation spectroscopy of lanthanide elpasolites - implications for the correlation crystal field. Chemical Physics Letters, 266, 195-200 (1997) . R.S. Armstrong, A.J. Berry, B.D. Cole, and K.W. Nugent, Chromium luminescence as a probe of site effects in the alum lattice. Journal of the Chemical Society, Dalton Transactions, 363-366 (1997) . A.J. Berry, C.S. McCaw, I.D. Morrison, and R.G. Denning, Two-photon spectroscopy of terbium(III) elpasolites. Journal of Luminescence, 66/67, 272-277 (1996) . A.J. Berry and K. Rickers. Experimental techniques for the study of hydrothermal fluids and silicate melts. Chemical Geology, 259, 1 (2009). A.C. Harris, A.J. Berry, D.R. Cooke, N.C. White, M. Newville, and S.R. Sutton. Metal-chloride complexes to 700 ˚C: decoupling of Cu from other ore forming elements in Sn granite fluids. Smart Science for Exploration and Mining, 1/2, 231-233 (2010). I.S. Rodina, A.N. Kravtsova, M.A. Soldatov, A.V. Soldatov, and A.J. Berry. Electronic structure of ilmenite: X-ray abosrption and DFT study. Journal of Physics Conference Series (XAFS14), 190 (2009). A.J. Berry, H.S.C. O'Neill, and J.F.W. Mosselmans. The oxidation state of uranium in zircon. Geochimica et Cosmochimica Acta, 73, A117 (2009). P.M. Doyle, A.J. Berry, R.M. Coggon, and S. Weyer. An experimental study of Fe isotope fractionation between silicate melt and spinel. Geochimica et Cosmochimica Acta, 73, A303 (2009). A.J. Berry, H.S.C. O'Neill, and G.J. Foran. 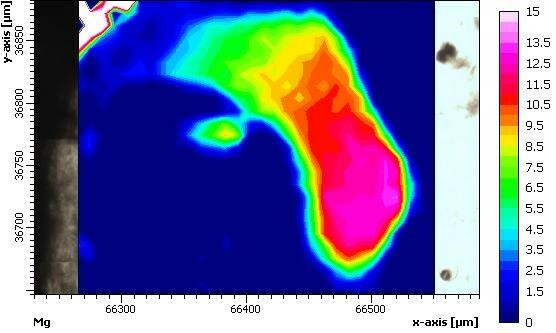 The oxidation state of uranium in mantle melts. Geochimica et Cosmochimica Acta, 72, A79 (2008). A.J. Berry, A.C. Harris, V.S. Kamenetsky, M. Newville, and S.R. Sutton. The speciation of metals in natural fluid inclusions at temperatures up to 700 ˚C. Geochimica et Cosmochimica Acta, 71, A86 (2007). L.V. Danyushevsky, A.J. Berry, H.S.C. O'Neill, M. Newville, and S.R. Sutton. Fe3+/Fe2+ of melt inclusions: implications for melt H2O contents. Geochimica et Cosmochimica Acta, 71, A200 (2007). A.J. Berry, H.St.C. O’Neill, J. Hermann, and D.R. Scott. The infrared signature of water associated with trivalent cations in olivine. Geochimica et Cosmochimica Acta, 70, A49 (2006). A.J. Berry, H.St.C. O’Neill, and G.J. Foran. Electron exchange between V and Cr in silicate glasses. Geochimica et Cosmochimica Acta, 70, A48 (2006). H.E. Höfer, G.P. Brey, G.M. Yaxley, and A.J. Berry. Iron oxidation state determination in garnets by EPMA and XANES. Geochimica et Cosmochimica Acta, 70, A256 (2006). G.M. Yaxley, A.J. Berry, H.S.C. O'Neill, and A.B. Woodland. Calibration of XANES for determination of Fe3+/SFe in garnet. Geochimica et Cosmochimica Acta, 69, A828 (2005). N. Metrich, A. Berry, H. O'Neill, and J. Susini. A XANES study of sulfur speciation in synthetic glasses and melt inclusions. Geochimica et Cosmochimica Acta, 69, A51 (2005). A.J. Berry, J. Hermann, and H.St.C. O'Neill. The water site in mantle olivine. Geochimica et Cosmochimica Acta, 68, A36 (2004). A.J. Berry, H.St.C. O'Neill, and G.J. Foran. The in situ determination of redox states in silicate melts. Lithos, 73, S9 (2004). A.J. Berry, H.St.C. O'Neill, K.D. Jayasuriya, and S.J. Campbell. A Mössbauer and XANES spectroscopic study of Fe oxidation states in silicate glasses. Geochimica et Cosmochimica Acta, 66, A73 (2002). A.J. Berry, D.G. Fraser, G.W. Grime, J. Craven, and J.T. Sleeman. The hydration and dissolution of periclase. Mineralogical Magazine, 62A, 158-159 (1998).